* Large Baskets by PC Locs make device deployments faster and safer, so that Teachers and IT Administrators can focus on creating an engaging learning environment. * Designed to go where other Charging Stations can't. Baskets by PC Locs allow you to share and safely distribute the devices that are stored in the Carrier 15 Charging Station, between multiple classrooms. They also enable students to assist in the distribution of devices, so teaching can happen faster. The Baskets are interchangeable with PC Locs Carts that use the same large Basket ecosystem, such as the Carrier 20 Cart. * Compatible.1 Includes three Large Baskets by PC Locs and a Carrier Device Rack for storing just about any device. You can store and safely distribute 13" Chromebooks, Tablets or iPad devices. * Secure. Keep your valuable device investments safe. The combination of welded steel construction, the mounting-kit and a hardened steel padlock, protects your devices while they're not in use. * Efficient charging. The Carrier 15 Charging Station can charge 15 devices simultaneously, including Chromebooks, Laptops and most Tablets, with or without most cases. * Wall or desk mounting. Transform any wall, desk or bench into a secure space for charging mobile devices. The Carrier 15 Charging Station is designed to be flexible and adapt to your surroundings. * Lifetime warranty. Schools can be tough on Charging Stations. PC Locs products are built to last. * Are your devices still too big for the Baskets? 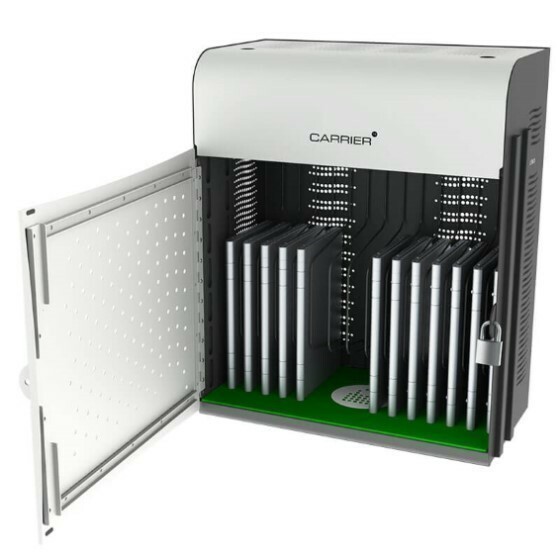 The Carrier 15 Charging Station also includes a Carrier Device Rack. The Rack is designed to accommodate up to 17" Laptops. * Easy cable management. 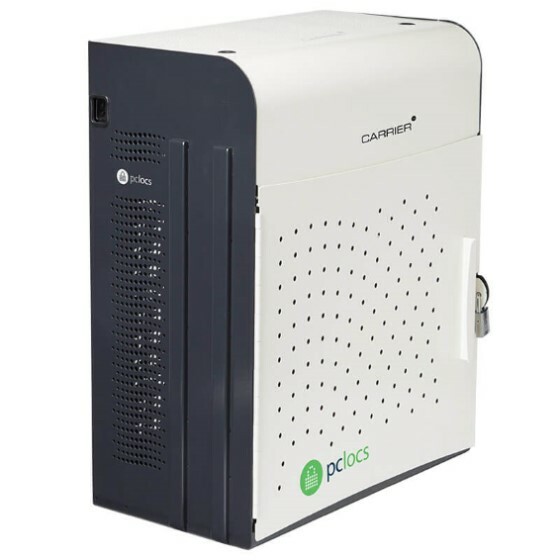 PC Locs cable management has been simplified so that you can wire an entire Charging Station in minutes. 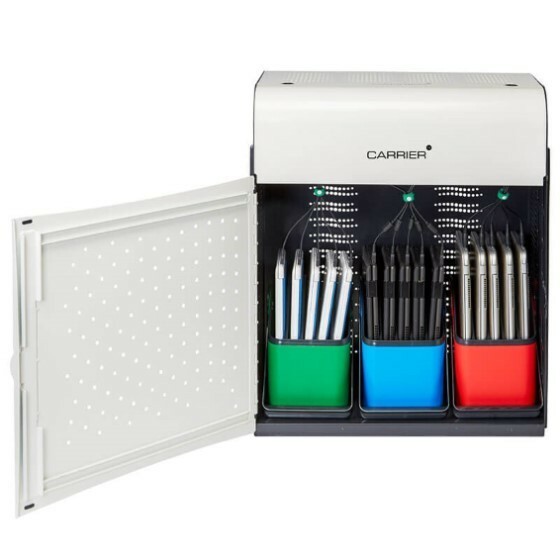 Save time with set up and gain time using your Carrier 15 Charging Station. * Secure charging. The externally accessible power outlet means that you can charge your devices while they're safely locked in the Charging Station. Additionally, the device power packs are securely stored away beneath the curved steel sliding lid and can only be accessed when the Carrier 15 Charging Station is unlocked and open.